Invisible Apple Cake (Gâteau Invisible) features dozens of layers of thinly sliced apples held together with only a little bit of cake batter. This impressive looking dessert is French, but it has become immensely popular in Japan. With apple season in full swing, I wanted to share this unique apple dessert. It is also something a little different you can bring to Thanksgiving this year. The cake is called Gateau Invisible because the apples disappear into the cake once it is baked. I’m not sure this is the most accurate description. 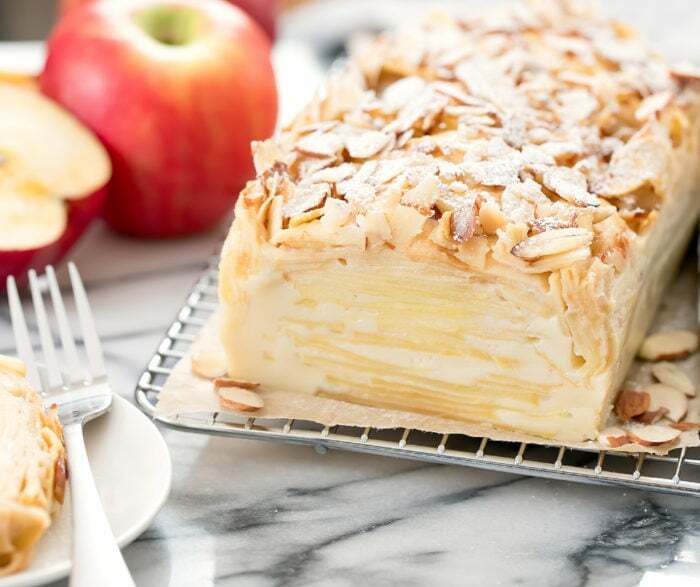 I’ve never had the cake in France, and perhaps the original version is made up of apples thin enough that they disappear into the cake but the Japanese versions I’ve found use thicker slices of apples so that the cake becomes dozens of apple layers. The cake is made up of sliced apples coated in a custard-like cake batter. 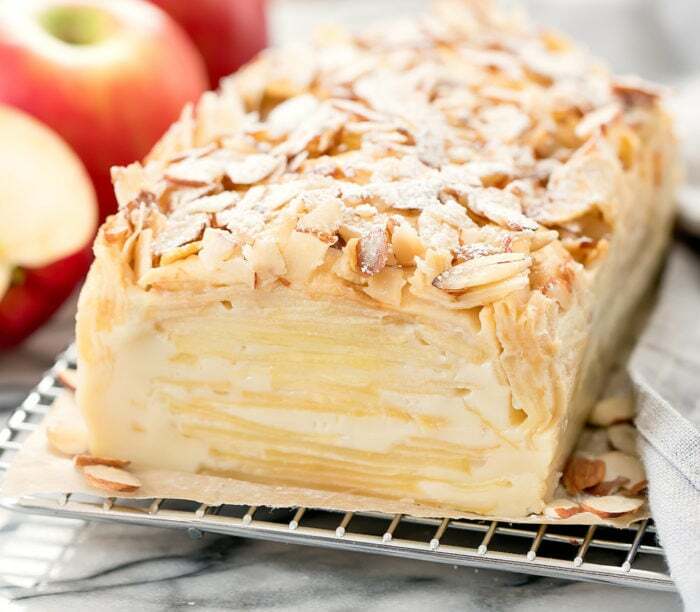 When baked, it becomes dozens of soft thin layers of apples held together by a firm custard. It is quite impressive to look at and it’s not as sweet as most desserts. Since this cake is made up almost entirely of apples, the apple slices are the most important step. Here are some tips and photos. Choose a sweet apple variety, like fuji, honeycrisp, ambrosia or pink lady. 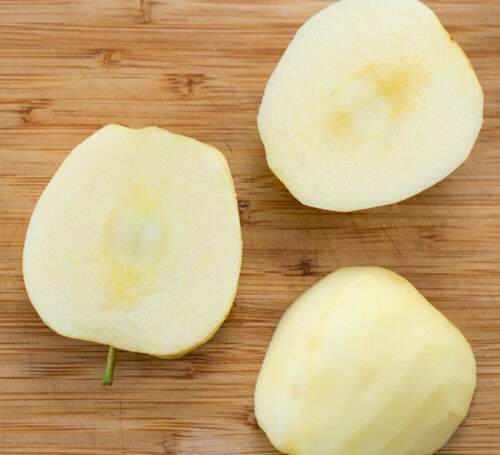 Using a sharp knife, slice one side of the apple as close to the core as possible. Do the same with the other side of the apple. Slice the two sides left, as close to the core as possible. 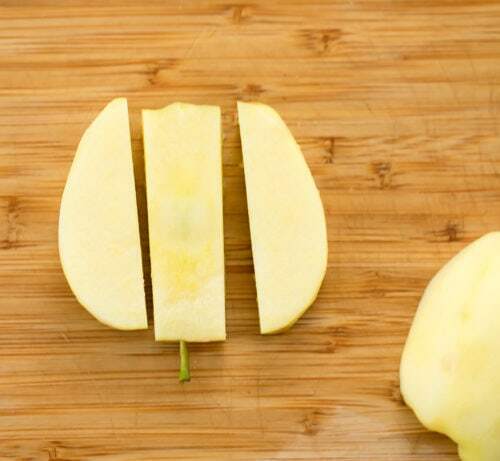 Flip your apple slices so the flat side (the cut side) is facing down. Now evenly and thinly slices the apples. The apple slices should be able 2mm thick. If they are too thin, they slices will break off before your knife reaches the end of the apple. If they are too thick, your apple layers will look too thick in the cake. You don’t need a mandoline to slice your apples. 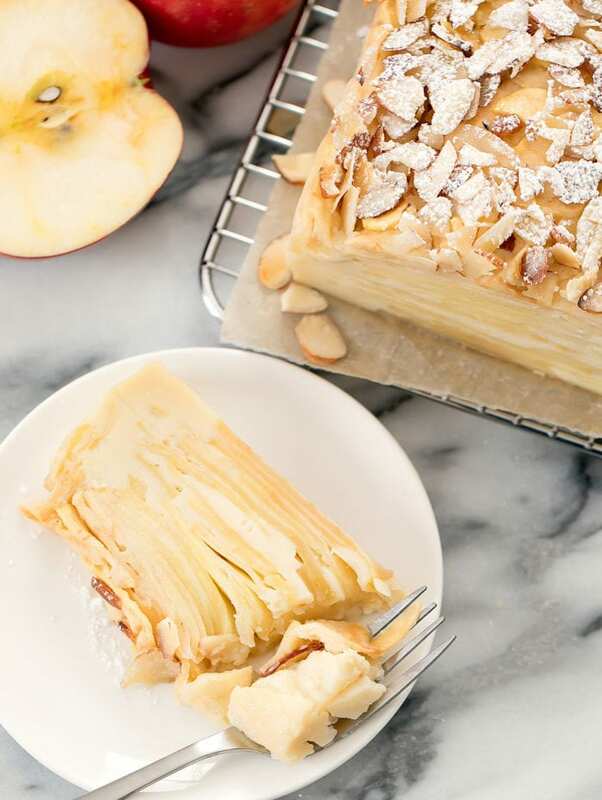 You can achieve thinner slices with a mandoline but you don’t actually want the slices that thin for this recipe because the apple slices will break when mixed with the batter and the apple layers disappear too much into the cake. Cutting by hand as thinly as possible is the optimal width for these apple slices. Once the apples are sliced, you make an easy cake batter which you can mix with a whisk and a bowl. No electric mixer needed. The apples are then added to the cake batter. 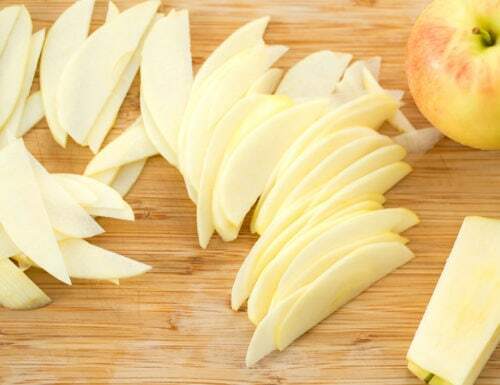 Try your best to separate any apple slices stuck together before adding them into the batter. Use a spatula to stir around the apples until all the apples are thinly coated in batter. Place the apples into a lined loaf pan. Try your best to place them in so they are all facing the same way. After all the apples have been added, pour remaining cake batter over the apples. Be sure to scrape your bowl to get every last bit of the cake batter. Top apple cake with some sliced almonds and place into oven to bake. Close to the end of baking time, you will need to place a foil tent over the cake so that the top of the cake and almonds don’t burn. Once the cake is done it needs to cool and set. The cake needs to be placed in the fridge for several hours, though ideally overnight is best. The custard needs to firm up or you will not be able to slice into the cake. The cake will shrink as it sets. When cake is ready for serving, remove from fridge. Dust the top with powdered sugar. Use a sharp knife to slice and serve. 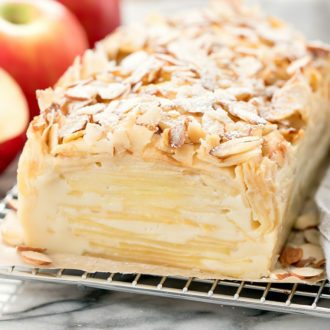 This unique dessert features dozens of layers of thinly sliced apples held together by a custard-like cake batter. It's not overly sweet and looks impressive when sliced. Peel the apples and slice very thinly, about 2 mm thick. Please see notes above for method to slice the apples. Preheat the oven to 350F. Line an 8 inch by 4 inch baking loaf pan with parchment paper. In a large bowl, whisk the eggs and sugar until pale yellow. Add the milk and melted butter and mix until smooth. Sift in the flour. You want to sift it in to keep the batter light. If you do not have a flour sifter, this can easily be done with a mesh strainer. Add about third of the flour into the strainer. Place strainer directly above the bowl with the batter and tap the side of the strainer against your palm, letting the flour sift through into the bowl. Repeat with remaining flour. Whisk the batter until smooth. Add about half the sliced apples to the batter. Do your best to separate any slices stuck together before adding. Use a rubber spatula to stir apples until they are all coated with batter. Add in remaining apples and stir and coat until all apples are thinly coated in batter. 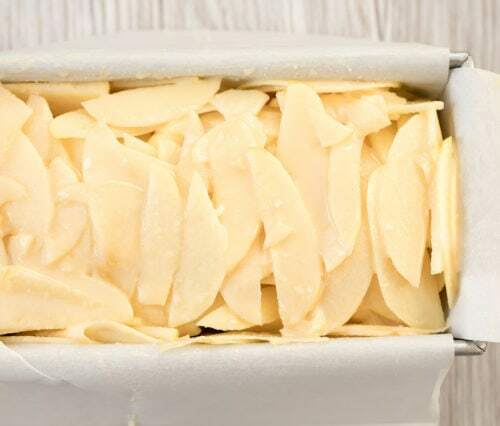 Spoon the apples into parchment paper-lined loaf pan. Try your best to make the apples all face the same way. Pour leftover batter over cake. Use spatula to scrape bowl to get every last bit of the leftover cake batter into your loaf pan. Sprinkle almonds over top of cake. Place loaf pan into the middle section of your oven and bake for 40 minutes. Cover top of cake lightly with a foil tent and bake another 10-20 minutes or until cake is done. 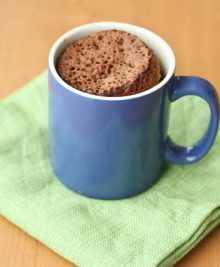 To check if cake is done, stick a toothpick into the cake batter and the batter should no longer be liquid. Baking time can vary depending on the amount of apples you used and how much moisture was in the apples. Let cake cool to room temperature. Place into fridge to set overnight. Right before serving, remove cake from fridge. Top with powdered sugar. Use a sharp knife to slice cake. You can play around with the amount of apples. The cake works with less apples but you will have less slices and layers and the cake will not bake up as high. For a very high and impressive cake, you can add one more small to medium apple. Do not go over 2 lb of apples as your cake will be too moist and will not set. Using a more narrow loaf pan will also give your cake more height. If you prefer sweeter desserts, use ½ cup in the recipe instead of 6 tbsp. You can also add a little cinnamon to the cake batter to give this cake more of an apple-pie feel to it. That looks really cool! Once I’m on winter break and have more time, I will try making this. Hope you have fun! Mr. K helped me make one of them and he was so excited with how it turned out that he brought his into work.